The newest wave of Marvel Legends is a Target Exclusive set. These six figures - Wolverine, Spiral, Union Jack, Silver Surfer, Adam Warlock, and black suit Spider-Man - come with the parts to make the Red Hulk Build a Figure. Most of these figures we've gotten more than once...Wolverine, Spider-Man, Silver Surfer all have had more than their fair share of action figures. Even characters like Union Jack and Spiral have had figures before, although it's been quite awhile. And God knows we've gotten an awful lot of Hulk figures this last year. So what would drive a collector to buying this full set and putting together the Red Hulk? Obsession? Insanity? An overriding desire to forfeit up $90 at the alter of Hasbro? Hell if I know. These are popping up at Targets all over the country right now. Expect to pay a whopping $15 each for them. Of course, there are variants just like always, although exactly what they are seems a bit confusing right now. 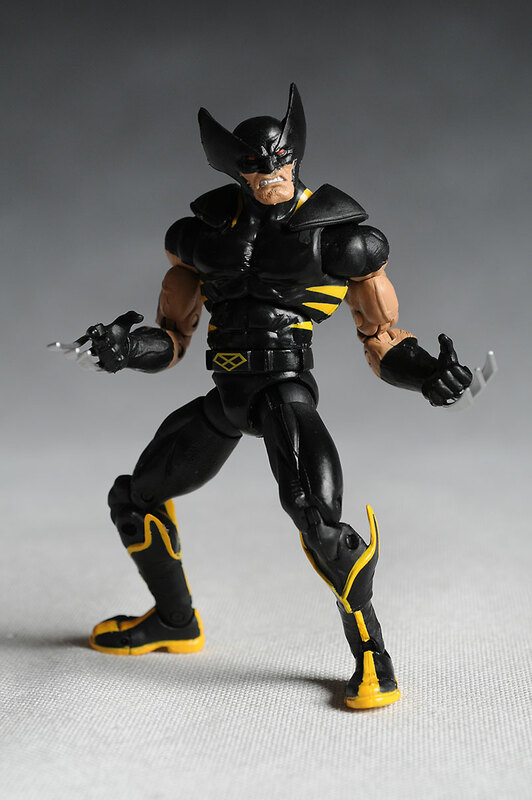 Clearly there's a variant on Wolverine (the regular comes in they yellow costume, the variant in the black shown here), but I thought there was a second one as well. Keep your eyes peeled for any that look different than what's shown on the back of the cardback. Nope, no packaging shot this time. Sorry, but I tore them out before realizing that I hadn't shot one yet. Hey, it's the same as the last few Marve Legends lines, so check out one of the recent reviews to see what it looks like in general. This time you get specific info on each of these characters, a 'Rosetta stone' on the back showing which Red Hulk piece comes with which character, and some decent comic based graphics. There's also a big "only at Target" sticker on the front in case you get confused. The packages are actually so good on this line, showing off the figures in the best possible light, that I believed them to be excellent when I picked them up off the shelf. Out of the package, my impression changed drastically. However, it's not the sculpts that were the object of my disappointment. That's part of why they looked so good in the package - the sculpts are actually pretty well done. Wolverine looks like the muscled up midget of a superhero that he is. The musculature is overdone in all the right ways, and he has a good gritted teeth expression that fits the character well. He stands just about 5 1/2" tall fully upright. Spider-man is a bit taller, coming in closer to 6", and less muscled of course. He's more svelte, but still has a very comic book style. Spiral has a great looking body, and I mean that in the least sexist way possible. Unlike almost every Marvel Legend female, she doesn't have gangly legs or arms, oddly shaped hips, or breasts bigger than her head. She looks like a hot female superhero, something they usually can't pull off in plastic form. She also stands just under 6" tall. Some folks may be put off by her hunchback, however. I can see how that might crimp her style. The three arms are situated with one on top and two below, in sort of a triangle pattern. That actually works fantastic for the articulation, and she looks excellent from the front. But if you look at her from the side you realize that she had to have some extra width in her upper torso to hold that third arm back there. They used the long hair to creatively hide it, but you still might find it not to your liking. Me, I thought it was fine. The hands on all three figures are very well sculpted, and Spiral's are designed to work with the accessories. 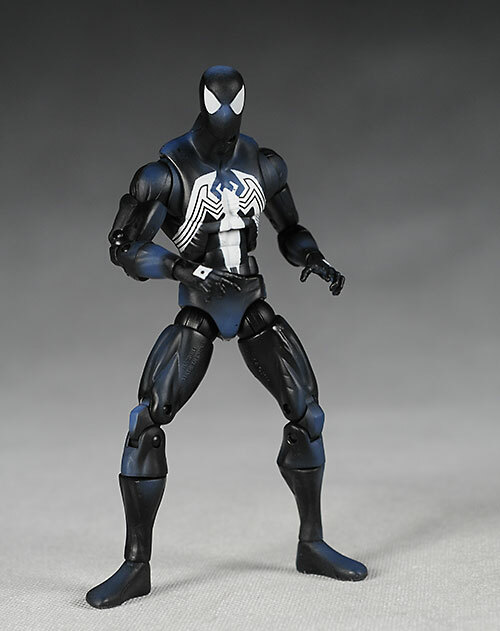 I like Spider-man's in particular, as the sculpted poses look terrific with just about any stance. The plastic is on the cheap side, particularly at the joints, but rather than attack them here for it, I'll be bringing that up in the Articulation section. Here's where things start to unravel. At first glance, the paint ops seemed decent, but once I had them out, and gave them a more thorough look, the issues appeared. Now, some of this is only visible under the harsh eye of the macro lens. This is particularly true for Wolverine, but trust me - you can see plenty of issues with the nekkid eye as well. Wolverine has plenty of slop around his face, particularly between the face and mask. The slop around the nose is so bad that in person it almost looks like he doesn't have a nose. The line between the mask and face is just about straight across, with no visible blip for the nose, and while it's clear in a photo that it's a poorly cut line, in person all you can tell is that there seems to be no nose. He also has some real inconsistencies in the finish from one area of the black to another. Some, like his shoulders, are very flat, while others, like his chest, are very glossy. The coverage on the yellow strips is a bit hit or miss too, allowing the black to show through in some places. I do like the way the hairs are painted on the arms, and I also appreciate that there are more actual paint ops on this figure than usual for Hasbro, but that doesn't remove the issues. Spiral is a bit better, particularly the body. There's still a little slop around the silver wrist bands, and some of the cut lines could be cleaner, but most of the work there is normal mass market stuff. She does have a few issues on the face, including too much gloss (what's with the gloss coat? ), some slop around the eyes, and a big nasty rub mark on her nose. If you're lucky, you won't have the rub mark, and the other issues tend to be hidden by the helmet. Spider-man has the cleanest work overall. The cut lines between the white and black colors are fairly clean, and there's only the occasional blip in the white symbol. His biggest issue for me is a more aesthetic one - I don't like the comic book blue highlights to the black uniform. I would have much preferred a solid black look, like Wolverine. The blue highlights are distracting, and a solid black repaint on this guy would make him look so much better. And then we get to the category where I have some of my biggest issues with the two boys. Spiral is not a problem here. She has the usual pin and post neck that all ML's have had, and with the long hair covering her hunch back, it's a pretty limited joint. She has ball jointed shoulders, double pin elbows, and cut wrists on all six arms, and these are designed to work really well together. The posing here is just about endless. She also has a ball jointed waist, ball jointed hips, pin and post knees, and pin and post ankles. These joints all work great, and allow her to take some interesting leg stances. The joints were tight, and the 'clicky' feature worked well. The only thing holding her back from a perfect score is the cheap pins. 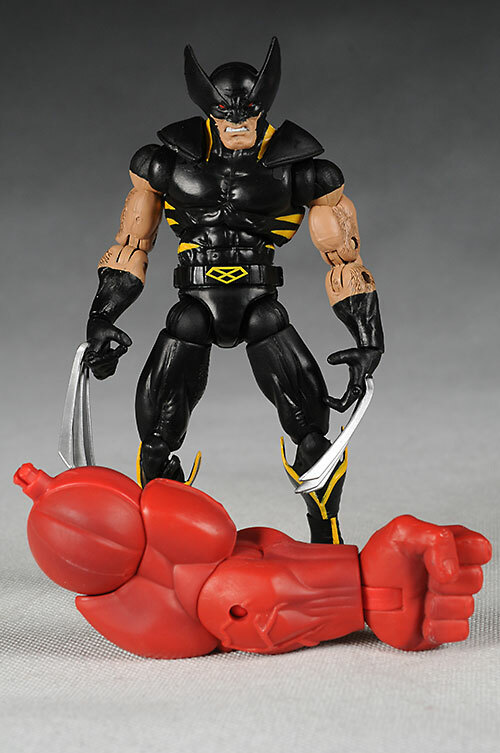 This soft plastic was a bigger issue for Wolverine. He has the same neck joint, and he has the newer ball joint plus swivel joint shoulders that allow for greater mobility. The shoulder ball is also jointed on both sides, giving the upper arms plenty of range of movement. He has the double pin elbows, cut wrists, and a single pin for the four fingers. So Wolverine has far more articulation than Spiral, yet he scores far lower? That's because many of the joints work badly. The pins have issues on both knees, being too short to fit fully through. This, combined with the soft plastic of the legs, makes for bad knees. Mine are very loose, and the left leg is just about ready to fall off. The clicky aspect of his joints seem far less useful. In the knees there's only one 'click' through the full range of movement, and because the joints are so loose, it's almost impossible to keep him standing at any other point. The pin ankles are also very loose, making it tough to get him into a pose, and once you do, tough to keep him there. On a final note, the cut calf is useful, but does look very odd in most poses. It causes the yellow line in the boot to not line up, and the overall boot can look funny since the upper 'wings' don't turn with the foot. Spider-man is less articulated than Wolverine, but more articulated than Spiral. 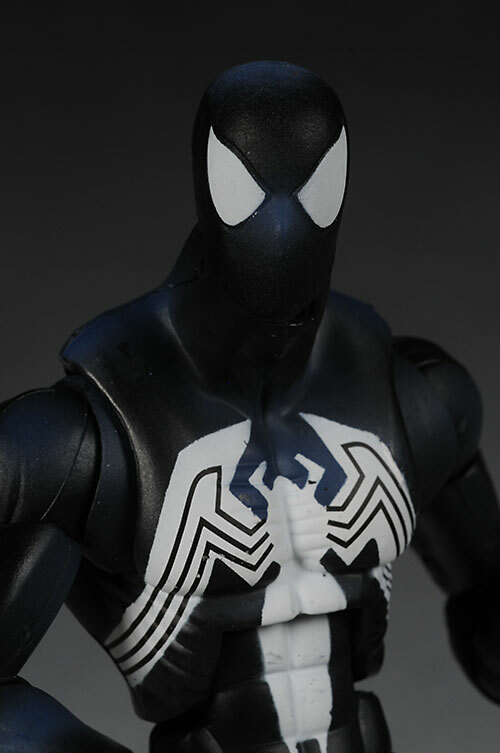 He has the same neck, as well as the highly articulated shoulders. 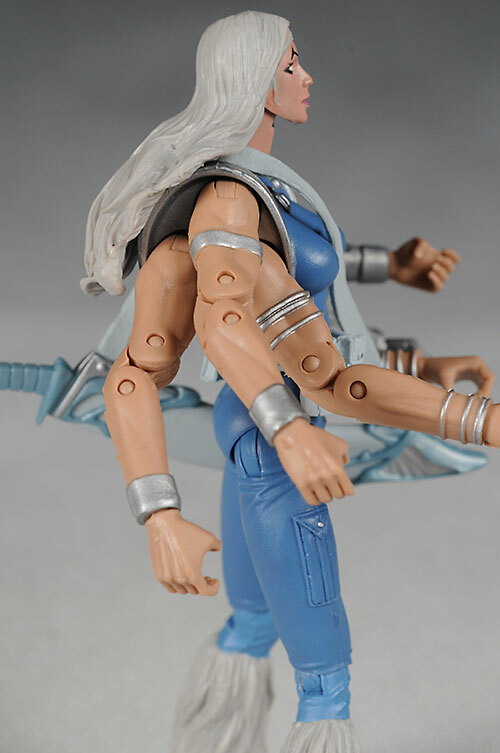 There's also the double pin elbows and knees, and these have the same pin issues as Wolverine. There's an ab-crunch chest joint, cut waist, and cut calves, but he has pin/post wrists instead of cut wrists. The ball jointed hips are jointed on both sides, there's a cut calf joint, and a cut ankle. I had much more trouble with the leg articulation on Spidey than either of the other two, and I can't quite figure out why. Maybe I got a weird left thigh...maybe there's something about the knee disc that is malformed...maybe it was just put together incorrectly. Whatever the case, the left leg does not work, and he was not able to take most of the poses I assumed he could take, considering the level of articulation. I was very frustrated with this figure by the time I'd finished shooting the photos. This category is way, way too easy to describe. Wolverine comes with a Hulk arm. Spider-man comes with the other Hulk arm. That's it. 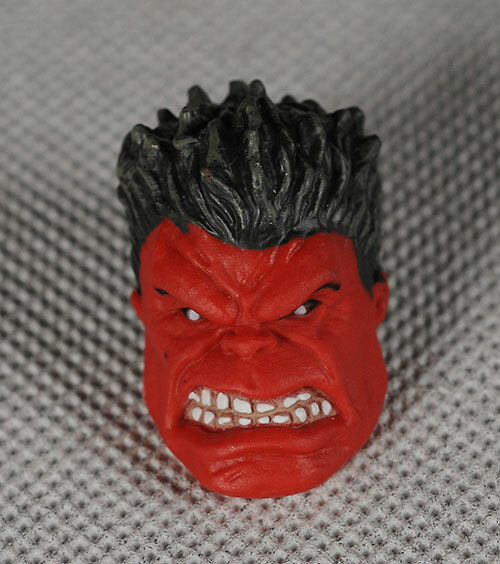 I suspect that even if you really, really wanted the Red Hulk, you're going to feel a tad ripped off by this. Spiral does much better. 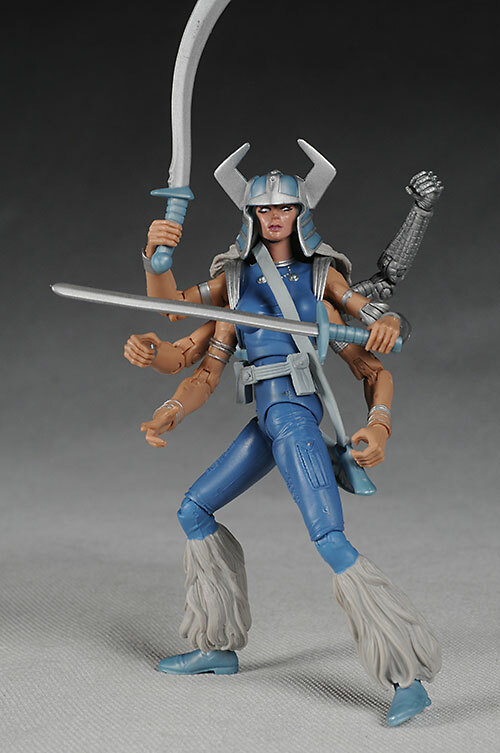 She comes with the critical head of Hulk, but she also has two loose swords and one that is sculpted into a scabbard. This scabbard fits around her shoulders and torso with a long strap. The plastic is as soft as you can get on her swords - safety issues I'm sure - but they do look decent in her hands, have unique sculpts, and average paint jobs. 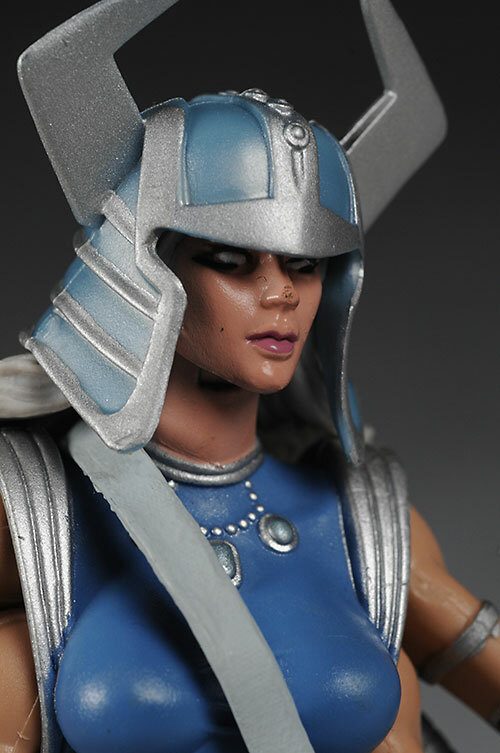 Along with her weapons, she also has a removable helmet. I'm counting it as an accessory since it is removable, but trust me, you won't want to take it off. She has the worst hat hair you'll ever see. I can tell you that just trying to pose these guys for photos was zero fun. The loose cheap joints make them frustrating as Hell, and I know that kids find that type of articulation frustrating as well. They love army men because when the stand them up the STAND UP. No kid wants to spend five minutes getting something to stand when they're just going to knock it down again. Spiral had less of these issues, and getting her to stand and stay standing was much easier. The arm articulation adds a lot too, and the design works easily and well. And then we get to here. With the issues with paint, cheap plastic, and articulation, the price point is simply way out of whack. Yes, they are exclusives, but they are exclusive to one of the largest store chains that carries any of the Marvel Legends figures. It's not like they'll be all that hard to come by. We saw this $15 price point with the Foom wave, but that wave had two advantages. First, most of the figures had some serious bulk, and if they didn't they had an accessory or two. Some even had the bulk AND the accessories. Second, they came with the very substantial pieces to the even more substantial Foom BAF. Here you're getting a BAF similar in size to the Grundy BAF that came with the $10 DCU figures. When I saw these in the package, I was much more impressed than when I had them out. The only thing you can really watch out for before buying is the paint ops, but you may find other issues once you have them home. I've heard people say that you can tell for yourself how good a figure is or is not just by looking at it on the peg. These figures are a perfect example of why that's not true. When I grabbed them off the peg, I was initially very pleased. 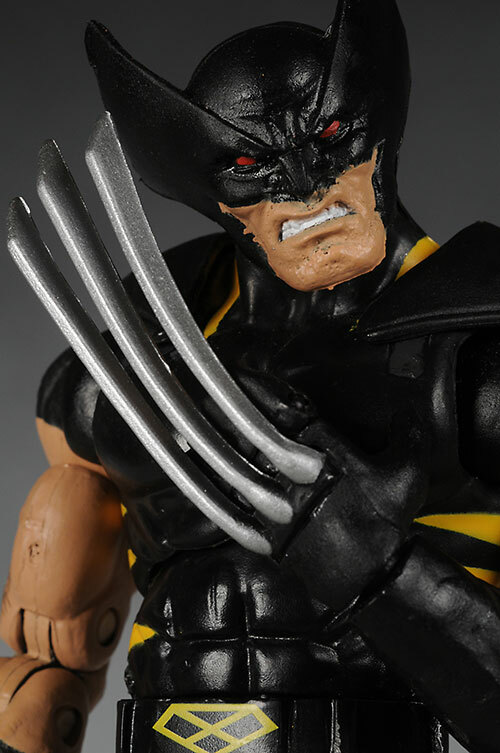 Sure I could tell there were some paint issues on Wolvie, but otherwise they looked great. Once I had them out of the package, it was an exercise in frustration. The loose joints, the cheap feel of the plastic, the difficulty getting them to pose...it all just kept reminding me that I'd spent $15 EACH on these figures. These are figures that you can get for $8 - $10 in other lines still that are as good or better, and there are many, many specialty market figures in the $15 range that are far better than any of these. If I were getting a BAF with this set that a) I really wanted (like Foom) or b) was really huge (like Foom), then the price point would have been a bit more tolerable, at least for me. But getting another Hulk, and one that isn't all that impressive, doesn't do much to ease the sticker shock. I might change my mind once I finally find the other three figures and can complete him, but I doubt that greatly. 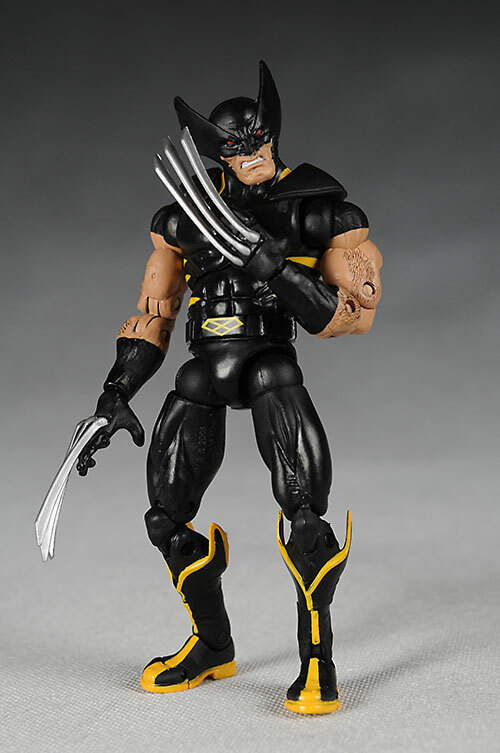 Now, there's probably some confusion here, because this is pretty much the exact same Wolverine Toybiz did in the ML line back quite a few waves ago, and I loved it. Ah, but that was for half the money, with a better paint job, and less trouble with the articulation. Cheaper plastic, worse paint, and a HUGE price increase does not a happy camper make Michael. I do want to make a special note here on Spiral. Had she been in the more acceptable $10 - $12 range, she would have garnered another half star overall. I really do like the body sculpt, and I think she's one of the best female Marvel Legends figures we've gotten in a long time. These are a Target exclusive - so that means your best bet is to hit Target! - the last was the Foom/Hulk wave, broken into one review here and another here. - I never did look at the third wave of Hasbro ML's, but I did cover wave 2 and series 1, first at MROTW and then here at QSE. - you’ll want to check out my review of the other four figures at MROTW. 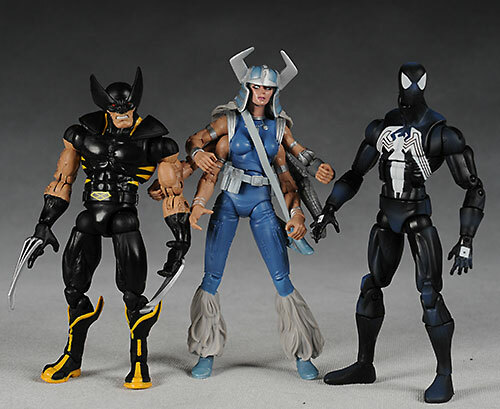 - Hasbro has also released several of the 12″ Marvel Legends Icons, including Punisher and Doom, and my favorite, Thor. - then there’s the various series reviews, including the Wal-mart series, series 13, series 12, series 9 (including Galactus), series 8 Captain Marvel and Doc Ock, series 7 Vision, series 6 Juggernaut, Wolverine and Deadpool, series 5 Blade, Nick Fury, Sabertooth and Colossus, along with series 5 Red Skull, Silver Surfer and Mr. Fantastic, series 4 Goliath, Punisher, Beast, Gambit, and Elektra, series 3 Daredevil and then the rest of the series, series 2 Thing and Namor, and finally, from three and a half years ago, the series 1 review.